Ryan Alrigo is happy to be covered in mud even without a toothbrush handy. When the Pro Class racer is asked what he loves about the Washougal Motocross Park, Alrigo laughs, exposing mud-stained teeth. "The hills, because few tracks have elevation changes and you can reach serious speed going down them," responds Alrigo, wearing mud like makeup. Every year 100,000 riders like Alrigo visit the 1.5-mile track and each rider takes home some of the track's dirt on their boots, bikes and in their mouth. Keeping track conditions ideal requires a fleet of backhoes, mounds of dark chocolate earth, and daily maintenance, which has been ongoing since the track's inception in 1971. "This piece of land was spotted by Dave Dimeo and Glenn Gordon when they were flying east of Vancouver, Washington in a plane," explains Ralph Huffman, who has owned and operated the track since 1987. "[Dimeo and Gordon] commissioned Bob Leach to design and build a motocross racetrack on what was a logged field." These days the only things being logged at the track are first, second and third place victories. 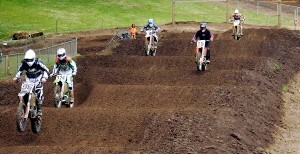 Riders pack down earth at the starting gate, trying to get any advantage possible to grab the holeshot. The scent of race fuel wafts alongside a breeze, while an orchestra of engines noisily waits for the fall of the starting gates. And they're off, with the wasp of two-strokes and roar of four-strokes heading towards the uphill, left sweeper. "When you start with 40 bikes at the same time, a sweeper to the left is safest," explains Huffman. 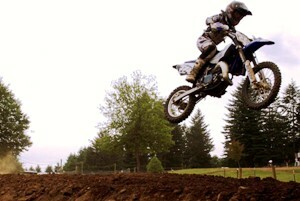 Trying to grab the hole shot. 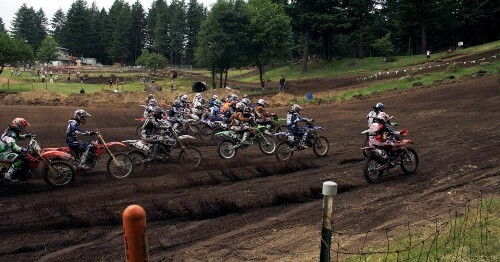 The start of the race often sets the pace at Washougal. Riders then negotiate a berm before U-turning and going uphill. Here riders start to separate as the steep hillside proves whose bike has power. The track darts into a valley of Douglas fir trees before U-turning back downhill where riders leap off the ski jump; a mild incline set against a steeply descending hillside. Going into the S-corners, riders swing back towards the catcher's mitt corner and traverse the whoop dee-dos along Kubota's straight away. Up over the horseshoe portion near the pond, riders leap the boxcar jump, named for the shipping container buried beneath it, and towards the home straight. Across the whoops and crossing the finish line takes riders past a banked corner and into a variety of jumps that deposits riders back towards the starting grid. "It's a big track with big jumps and fast motocross racing," explains amateur Ryan Brown after completing a lap. Everybody had something different to say about what makes Washougal great. "The original layout," explains track announcer Brian Barnes. " Not to mention lots of natural terrain, obstacle and elevation changes." From Honda and Hummer commercial shoots to amateur days and AMA national races, the Washougal Motocross Park stays busy year round but the AMA Nationals draw the biggest crowds. "For the National's three to four days, we get thirty thousand people coming to watch," explains Huffman, "in addition to 1800 amateur racers in the preceding days." The AMA has been holding Nationals at the Washougal track since 1980, when first Huffman loaned money to get the track up to National standards. "AMA sanctioned Nationals has all the big names like James Stewart and Andrew Short," explains Huffman. "When you say James Stewart, motocross people know who you are talking about." Amateur races average 450 bikes in a dozen classes, meaning no matter what you ride and your experience riding it, Washougal has a class for you. If you are interested in racing but are not a Ricky Carmichael just yet, don't fret. 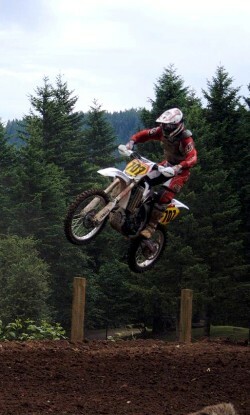 Novice riders rejoice, because for $30 the Washougal Motocross Park offers amateur days where riders can hone their track skills from 9am to 4pm, without the pressures of racing. (See the track's website for available dates.) Riding requires AMA membership, which starts at $39 a year, but when you consider that the AMA has been protecting motorcyclists' rights on and off-road since 1924 in addition to sanctioning races, the money is going to a good cause. "I've announced to over three generations of people," explains Barnes. "It's the love of the sport that brings them back and that there's always good racing." Many of the people watching and volunteering at the races are not riders themselves but that sense of comradery brings them back weekend after weekend. "I never rode professionally," says Huffman, "but my kids have and that's why I've been so involved." Because everyone at the track is one big family doesn't mean you can forget to wash and brush your teeth. p align="right" class="auto-style2">Sean Coker is a mischievous moto journalist hiding out in the southeast corner or stump town.